According to the product’s website, Steinberg’s Sequel is “designed for first-time computer music enthusiasts,” and is an “all-inclusive music production platform” that makes it “…the perfect first step into music production and performance” according to the manual. In reality, those sweeping promotional descriptions are terribly misleading: Sequel turns out to be quite appropriate for seasoned professionals as well! At a list price of $129, this easy-on-the-curves (learning, that is), streamlined, loop-based mini-DAW is definitely poised to give a few bigger fish a run for the rapids. Both under the hood and in the driver’s seat, Steinberg’s Sequel draws heavily from the core technology within its popular Cubase DAW platform. The Sequel user interface bears more than a passing – albeit significantly hipper – resemblance to the latest version of Cubase (v4), and several of the new features from that program have been ported directly into Sequel. 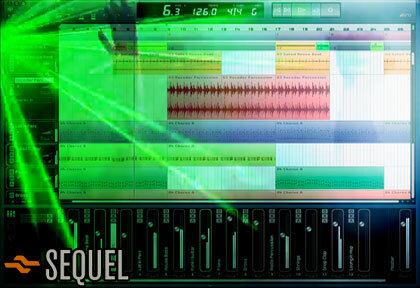 Sequel’s overall operation and single-screen GUI, however, are more closely related to popular loop-based programs like Sony Acid and Apple Garageband. Along those same lines, Sequel combines a clean, bars & beats grid timeline with straightforward drag-drop-and-drag (extend) event arranging, tempo auto-conforming, key transposing, MIDI sequencing and multitrack recording. Included for use in the program is a large collection of loops and other audio content, sampled and synthesized virtual instrument sounds and built-in VST EQ, effects and other processing. Sequel’s recording/project file format is stereo WAV at 44.1 kHz (16 or 24 bits), and the program supports menu or drag & drop importing of WAV, AIFF, MP3, WMA, WMA Pro, OggVorbis and standard MIDI files (SMF), plus export to WAV, AIFC, AIFF, WAV64, and OggVorbis formats. As with Steinberg’s other audio software offerings, Sequel is compatible with both Mac and PC systems. Although it could be considered a “basic” software application, the program requires a bit more hardware to meet minimum requirements than one might expect. Here’s a brief rundown (but be sure to check the Steinberg website for full specs and compatibility): Windows machines require XP (Home or Professional) or Vista Home Basic and above, an Intel Pentium or AMD Athlon 2 GHz processor and an ASIO compatible interface (for low latency performance) though DirectX will work. Mac minimum requirements are OS X 10.4, a Power Mac G5 1.8 GHz or Core Solo 1.5 GHz and CoreAudio compatible audio hardware. Both platforms require at least 1 GB RAM, 6 GB of hard disk space, a Display resolution of 1280 x 1024 pixels, a DVD drive and an Internet connection (a must for license activation).OK, enough of this yakity yak; there’s plenty more specs in the manual, should you require them. Now it’s time to play! With a nod to Sony Acid and a wink to Apple Garageband (and a nudge-nudge to a couple others), Sequel leverages Steinberg’s considerable audio and MIDI software acumen to boldly go where neither of the aforenamed apps have gone: a slick, super easy-to-use loop-based mini-DAW that spans the great divide with its cross-platform interface. Apart from the usual protectionism regarding the DAW computer I use professionally, Sequel’s standalone, all-in-one production platform was a perfect match for my new Intel dual-core (1.8 GHz x2) laptop with 2 GB of RAM running Vista Ultimate OS. Key Features: Loop-based music creation and live performance software; Mac/PC compatible; unlimited audio, midi and instrument tracks; 32-bit floating point internal processing; nearly 5GB of audio content included; streamlined single-page interface (with lower-third six-page Multi-Zone interface). Speaking of content, Sequel comes with a generous (nearly 5 GB) collation of royalty-free audio content for use in your projects. The collation includes literally thousands of high-quality loops, one-shots and other goodies – all hieratically meta-tagged across a wide range, with a drill-down progression from categories to subcategories to styles, substyles, and character. Consequently, navigating, searching and auditioning audio clips are completely intuitive and manageable. The program also comes with 600(!) MIDI-playable sounds from (and powered by) Steinberg’s Halion One sample playback instrument. Sequel allows the user to audition instruments sounds and loops (in the correct tempo and key), all while the project is playing. Instrument tracks, by the way, are combined VSTi audio output (Hal One in this case) and MIDI data tracks that shield the user from the usual I/O and channel configuration rigmarole. As mentioned earlier, Sequel uses a streamlined single-screen approach, with the Cubase-like Arrange Windo… err, Zone occupying the upper two-thirds of the screen (as part of the hip-ification effort, all functional elements are now “Zones”). A tabbed six-zone section called the Multi Zone fills in the lower third, providing instant access to the Mixer, Track Inspector, Media Bay, Audio/Instrument Track Editor (context sensitive), Arranger (live performance) and Program Setttings pages without losing sight of your project timeline or cluttering up the screen with open windows. At the top of the screen is the Pilot Zone, a.k.a. transport bar, that also provides easy icon-and-tool tip access to the most-used operational functions (the sort usually relegated to dull menus and pop-up windows). Besides Sequel’s incredibly intuitive operation and well-appointed content and instrument collection, the most surprising discovery for me was that, despite its entry-level price, the program is not hamstrung by the usual entry-level restrictions. For instance: unlimited audio and instrument tracks; filter cutoff, resonance, drive, DCA attack/release, LFO modulation and effects control on sampled instruments; powerful (yet easy-to-use) automation of levels, processing and effects; automation track overlay and editing; Cubase/Nuendo’s 32-bit internal mix engine; some really good effects and dynamic processing; Steinberg’s powerful MIDI note and control editing; and Cubase/Nuendo’s non-linear project arranging system (plus Ableton Live-style triggering from on-screen pads or computer keyboard); and many other common features usually stripped out in rudimentary and even LE versions. If the $129-list Sequel was exactly as billed – an entry-level program for first-time users, etc. – and didn’t draw me in with its innovative and powerful features, I wouldn’t feel that it’s quite fair to raise some of these issues (nor would I be writing this review, for that matter), but it is so close to perfect for pro use, that I would really love to see a few improvements. OK, I don’t want to seem like I’m bullying a school kid, because I really do appreciate to whom Sequel is being marketed and its unequivocal value, but for the love of Geffel, please allow the option to transfer the Sequel’s Syncrosoft authorization to a USB dongle (like all other Steiny products) so I can take it with me or use it on my production DAW. As a longtime user of Steinberg’s sequencers (and I mean Commodore-64 longtime), and a big fan of the company’s Nuendo postproduction platform, I approached the prospect of reviewing “the perfect first step into music production and performance” Sequel software with what could best be described as an unbridled lack of enthusiasm. But once I climbed down from my Nuendo horse, gave the install DVD a spin and fired up the program, I discovered the wild fun that can be had with this fast and friendly mustang. Sequel strips away most of the impediments to creativity imposed by full-scale DAWs and in many respects, beats the established loop-based programs at their own game. At an astounding street price of $99, Sequel and its huge content collation are a super value, and a refreshingly fun experience to boot. I look forward to what Steinberg has in mind for Sequel’s future (Sequel Sequel?) – I am especially keen to see ReWire support and the option for authorization to a USB dongle for those of us who work in multiple locations.